Peter Lamprey explains that they have not seen so much action this month, Stuttgart being their last target when they met no resistance. The squadron is under strength and the new crews are not yet settled in. He recalls social life and concludes with some banter. As always, just as I have summoned enough strength to post a letter to you, I receive your communication. Whether this is just coincidence or sheer perversity on your part, there is no way of knowing but if it should be the latter I am afraid I shall have to get your trousers down a bit lively in future. However thanks for the letter - "Royal" and the P.O. I am glad to hear Alf Barnes is out of dock and hope he keeps fit and well in the future. worth reading. If he should care to finish what he intended and post it to me I shall be only too pleased to destroy it unread. So far this month we have not been thrown at the Hun the number of times we expected. Stuttgart was our last target and it was a piece of cake. No flak. No fighters and altogether like taking money from Old Sam at solo. Tonight however we are operating again and have been lent a brand new kite as our own has nearly had its time as an operational unit. The squadron has not suffered much in the last few affairs but is still badly under strength and the new crews are not really bedded down to the life yet. This makes for quite a bit of excitement when they are milling round the circuit trying to land after an op. What with intruders and sprog pilots over the 'drome you are a damn sight safer over the target. Life otherwise runs its usual course and we manage to get into the big town now and again for a spot of dissipation and general debauchery. The beer situation is not too good these days but we manage to get just enough to keep ourselves in a state that makes us useless for everything but flying when forced to. If we are kept here for another three months I shall have to find a manager for the "Boars Head" as it is mine after two more nights like the last. I note, with interest, that in the "Royal" there is a statement to the effect that Charlie Standivans' artistic efforts are appreciated by all. They might be in some quarters but I can assure him that a certain senior N.C.O. of the R.A.F. will take him apart to see how he does it on the next occasion of their meeting. If that doesn't cure him a little 252 action will soon get him something other than drawing to do in his spare time. Having covered practically everything all that remains is to close down. I am sorry to hear about Bill Crawford. Thanks for not letting me have the information I asked for. Look after the children. All the best. P.S. Tell Hunty I will accept his gift next time I come up, and if he can only pinch a few marrows as well from Harry Straw's allotment I'll take them. 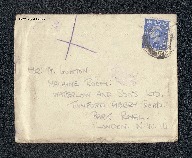 Peter Lamprey, “Letter from Peter Lamprey to W Gunton,” IBCC Digital Archive, accessed April 20, 2019, https://ibccdigitalarchive.lincoln.ac.uk/omeka/collections/document/6619.